"This we will do within the timeline," Premier Smith told reporters, during his August 29, 2018, ‘One-on-one’ interaction held at the Central Administration Complex. "The Government have been also through their various agencies putting together recommendation for government response and government will also have a forum where we can have additional information for anybody that wishes to make comments," noted the Territory’s Premier. 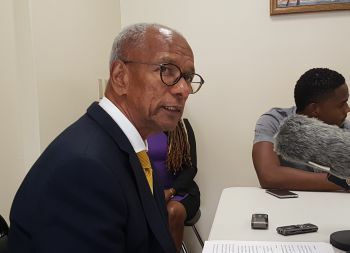 Dr Smith's position, contrasts that of his Govenrment co-Leader, Honourable Myron V. Walwyn (AL), who had lashed out at the UK in a public outburst over its approach to the inquiry. Hon Walywn on Monday August 27, 2018, during the NDP’s radio programme ‘Drive Time,’ took aim at the UK body, blasting their approach of launching the inquiry without even a formal notification. He disclosed at the time, that the Virgin Islands (VI) government only learnt of the decision after it was posted online. 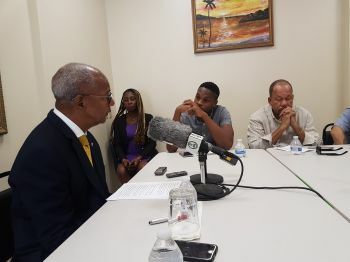 Asked if the VI is obligated to send a submission, Premier Smith replied, "…it is not something that is directed, it is not a letter sent to the BVI (British Virgin Islands), it was something put online for everybody and anybody to respond to." The UK’s Parliamentary Foreign Affairs Select Committee announced on July 20, 2018, a formal inquiry into the future relationship it shares with its OTs and to look into the effectiveness of the Foreign & Commonwealth Office’s (FCO) management of its responsibilities towards them. Same thing I say --- One leader at a time. Grandstanding!! I’m so sick of Myron falcon!! You are sick of the falcon? Well hon, you are going to have to keep on exhaling unessary energy being sick of the falcon. If you feel that you can do a better job than the falcon is doing, step up to homeplate. Sincerely, Another vote for Myron. Hold the F**k up about a bunch of educated submissive broke people that Myron uses. When you can produce RECEIPTS about your allergations, please make them public. Until then stay in your damn lane. Remember this, for every 100 that is against Myron, 150 is for him. The co-leaders of the NDP, Dr. Hon Premier D. Orlando Smith (At L), MoF, and Hon Myron Walwyn (At L), MEC and NDP Chairman-elect, are taking diverging views on the UK-VI relationship inquiry. Doc is of the opinion that the time allowed was adequate; Myron, thinks differently. Is this a clear example that the NDP is fragmented, disorganized and seemed to display irreconcilable diffremces. Nonetheless, there can only be one leader at a time, ie, unity of command. Doc is Premier until election is held and a new government is formed; at that time he will relinquished the Premiership. Thus, the Premier is the point person and should coordinate the government response for submittal. Diplomacy should be employed with the UK before adopting a scorched earth approach.